We’re continuing to explore key challenges in wireless network design: How do we get the maximum coverage with the least interference and the best throughput? In our last post, we looked at coverage. 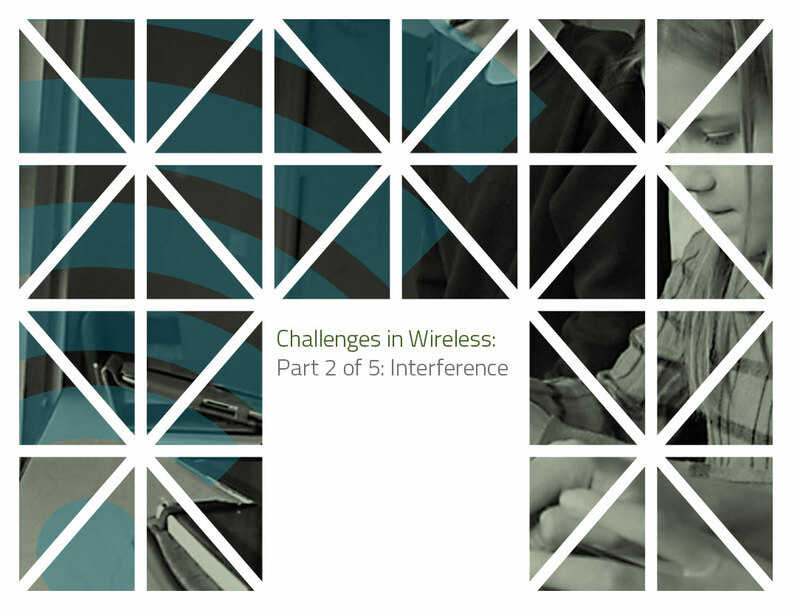 Today we’ll talk about interference, the single biggest challenge for proper wireless network design. In an old riddle, a guy in a bar is telling a fascinating story, with three friends hanging on every word. Still, before long his buddies walk away. Why would they lose interest? Answer: The noise made by others talking in the bar makes it impossible to hear what their friend is saying. This is exactly what happens in many wireless networks. For example, in large building or a crowded neighborhood you may have ten 802.11n networks within range of each other, all tuned to Channel 3. This is co channel interference and it can be a major problem. Sometimes it happens after you’ve had your network running for a while. Someone next door sets up a new network, tunes it to Channel 3 and you’re done. The first thing you’ll want to try is switching to another channel. You may do that manually or you can use software, perhaps supplied by your device manufacturer, to look at your neighbors and recommend the best channel for wireless in your location. Often the software will display a graph: here’s your network, here are your neighbors, and since their coverage areas each form a perfect circle, you won’t have a problem if you tune to Channel 9. Of course, that doesn’t take the densities of the walls into account, which ensure that, outside of a gym or big auditorium, there are no perfect circles. For that reason, the only way you can be sure you don’t have co channel interference on a given channel is to walk around your building and measure it. Often network managers will use the software to give them a base design, but then go back and modify it as needed. When all else fails, the answer may be to turn down the power on your radios and ask your neighbors to turn down theirs. You each want enough power to cover your own users, but not so much that it causes problems next door. Sometimes you can make that happen by offering to fix your neighbors’ Wi-Fi or offering to provide the Wi-Fi for them. At that point, you may be able to specify the channels everyone uses, control the power levels they use or even specify the location of their access points. But even in a controlled environment, someone may decide they’re not happy with the network, so they bring in their own access point and plug it into the wall. By so doing, they make the problem worse for everyone. You will have to find these rogue devices and eliminate them. One of the best ways to avoid the problem is by limiting the number of network ports that are hot. Sometimes your co-channel interference is not from a Wi-Fi network, but from other 802.11 wireless devices such as door locks, security cameras, intercoms, baby monitors, wireless LCD monitors, and wireless phones. Right now, there are considerably fewer of these devices using 5 GHz than 2.4 GHz, so switching to 5 GHz radios can often solve the problem. If not, you’ll want to search for a channel not used by these devices, or look at whether you can change the power of their radios. Microwave ovens, florescent lights and power lines can throw off noise at the same frequencies as your network. It’s a common error to look only at 802.11 devices, when your real solution may be as simple as replacing an oven. Here again, though, non-Wi-Fi devices are most likely to interfere with networks operating in the 2.4 GHz range. Interference can be extremely frustrating in that you can test carefully and eliminate the problem today, only to have it crop up tomorrow, worse than before. Buildings are living, breathing things, and so you will need to tweak your network on an ongoing basis.